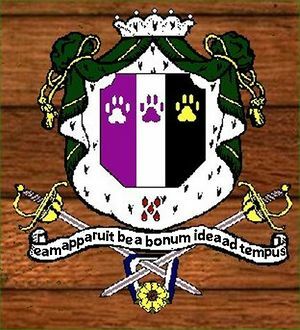 Per pale purpure and sable, on a pale argent between in chief a cat's paw print argent and a cat's paw print Or, in chief a cat's paw print purpure. 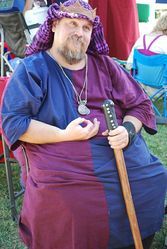 Master Gulliver Blackrune joined the SCA in May of 1982 in the Barony of Angels. Holder of a Patent of Arms in the Order of the Pelican. 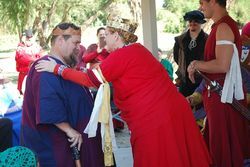 He received a Court Barony at Dreiburgen Anniversary 2014. Married to Mistress Vivienne Duval. Founding Member of House Blackrune, second of the five Blackrune Brothers, and a past Captain of the Blackrune Free Company. Barrister on the Goode Ship Indigo Rose. Past Preceptor of the Order of the Purple Cross. 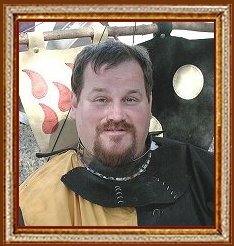 Member of Sietch Persistent & House Blackspear. Lieutenant and Founding Member of The Third Auxiliary Dragoons. Squire number 10 for Kyr Yaroslav the Persistant. A new persona is in development to reflect current activities. So far "Masutā Garibā" is all there is to it. Master Michael Gulliver Blackrune or Michael Gulliver Runenior de la Vendome. A late 16th century cavalier of French extraction. Having spent 30 years embroiled in the French religious wars of the period, he tired of the hard life and sought softer living. Born June 15, 1515. Served in various campaigns for France until his semi-retirement in 1562. Since then he has spent most of his time in the fore-deck of the good ship Indigo Rose, Captained his sword-brother, Captain Corba ap Allen. There he would read his silly books and engaging in merchant affairs on the high seas. While in port he spends his time in the Inn of the Crimson Spade, where in their good company he is known as the Barrister. Often using his book-learnin to smooth the stormy seas the merchant sailors find on land. Returning to France and active duty to join an elite company of solders in the French Army, the Third Auxiliary Dragoons are raised in time of war. There he held the rank of Lieutenant, serving as a staff officer under the elusive captain, till his retirement. Commonly known by the name Gulliver even though his first name is Michael. A previous persona, Michael Gulliver Blackrune, was an Anglo-Norman crusader. Born near Hastings, England, in 1170. A fatherless boy of a disgraced noblewoman, he left an almost certain life in the monastery to follow a Norman baron to Outremer. There he eventually became a Templar Sergeant. After becoming disillusioned by the leadership of the Order he left the Templars and helped found a confraternal group called the Order of the Purple Cross. In time he served the Kingdom of Jerusalem, then the Emperor of Rome in the East. He was last seen, in extreme old age, having taken holy orders, he traveled with a merchant caravan to Cathay, determined to convert the Emperor of China to Christianity. Where his bones may lie only God knows. This page was last modified on 12 June 2018, at 22:14.